The African Vandals have a Littoral homeland which affords them the advantage of landing troops to flank an opponent. In addition the Vandals have an abundance of noble cavalry (3Kn) and one light horse; not exactly an army which requires much finesse. This should prove an interesting match up. The Vandals decided to deny the Byzantine the advantage of any terrain and deployed amongst the difficult hills and woods bordering the shoreline. As expected the Vandals landed three elements including the light horse to flank the Byzantines. Exiting the defile, the Vandals quickly expanded their line while the landing force approached the Byzantine reserves. Low pip scores bedevilled the Byzantine for the first three turns. The Vandals struck first and sent all the Byzantine cavalry recoiling ending the turn with an even 1 -1 score. Afterwards, it seemed the Vandals could do no wrong and began shredding the Byzantine formations. Final score 5 – 1 for the African Vandals. This time the Byzantine defended anchoring their right against a difficult hill and wood on the opposite flank. The difficult hill covered the flank well enough to permit any landing by the Vandals to be done in front of the deployment area. The Vandal landing came as no surprise, but the speed at which the main Vandal force attack did catch the Byzantine flat-footed. At this juncture, the score reached 3 – 2 in the Vandal favour. The Vandal continued to apply pressure and secured a decisive victory; score 6 – 2 African Vandals. The Vandals feeling generous gave the Byzantine the joy of deploying amongst two difficult hills and two woods. This forced the Byzantine Strategos to cover the extreme flanks with cavalry leaving the main body to form up on the difficult hill and in the narrow defile. The Vandals formed all their troops opposite foregoing the use of a landing. Struggling through bad going, the skutatoi and psiloi lined the slopes with the main cavalry moving forward. The Vandals decided to hold off any forward thrust and work on the Byzantine flanks as the command radius of the Strategos would be constricted. A series of good pip scores allowed the Byzantine to withdraw their main body deeper in the defile and move some reserve units to the flanks. This manoeuvre eventually gave the Byzantine a needed advantage over the Vandals. Both Vandal flanking formations were essentially beaten off bringing the Byzantine a much needed victory, score 4 – 1 Early Byzantine. The African Vandals dealt the Byzantine a good thumping in the first two games and a third match was needed to force the Byzantine to do what they do best – defend. This was not the first time that Byzantine cavalry have advanced forward only to retreat on the following turn. All that is required is patience and await the proper moment to attack (and good pip scores). Historical match up – Early Byzantine vs. the Gepid. Match number five takes place in the Gepid homeland of the steppes. The Gepid field equal number of knights, warband and skirmish archers so will pose an interesting opponent for the Byzantine. Unfortunately, the speed with which each game moved few photos were made. Two gentle hills and rough ground were the only salient features of the battlefield. The Gepid deployed and infantry centre with skirmishers evenly distributed on both its flanks. All the Gepid noble cavalry formed up one the left flank. The photo shows the Byzantine bound of turn three. The legions supported by bucellarii have engaged the Gepid warband. In two turns, the main strength of Gepid infantry was destroyed closing the game with a score of 4 – 0, Early Byzantine. This time the Gepid deployed its main strength in two lines, the noble cavalry supported by Gepid warriors. The Byzantine Strategos placed the legion and its support on the right and would move ahead supported by the main body of cavalry. On the left wing, two bucellarii and Hunnic LH would flank the Gepid force and attack their supporting line. The near destruction of the Gepid reserve line (3 x 4Wb) had the desired effect of stinging the Gepid noble cavalry into action. Despite some loss, the Gepid force capitulated, score 4 – 2, Early Byzantine. The final game, the Byzantine Strategos switched commands giving the other regiments an opportunity to test their ‘metal’. The made a concerted effort to breach the Byzantine line and this they did by eliminating half the skoutatoi. On the Byzantine bound and with a poor pip score of 'one', the skoutatoi destroyed a second unit of Gepid cavalry. This photo shows turn four and the completion of the Gepid bound and brought the score to an even 2 – 2. The legionnaires, fresh from their victory over Gepid cavalry now moved on the exposed flank of the Gepid command. Together with the Herul symmachoi, they brought a close to a well fought battle. Score 4g - 2, Early Byzantine. Despite the 'Eternal Peace' the Byzantine and Sassanid faced off on a number of occasions, Lazica, the Caucusus, Armenia and in Syria. No allies were used in the three matches as these will be used in a later rematch. The Sassanid denied the Byzantines the use of any advantageous terrain which meant the Sassanid deployed in serried battle array. Leading the assault were the massed levies supported by elephant and as the group made its way forward Asavaran formed up on it flanks. Poor pip scores plagued the Byzantine that the initiative continually slipped through their grasp. This was a slow meat grinder of a battle dominated by the Sassanid from start to finish. 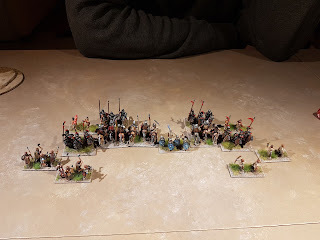 Score 4 – 2 Sassanid. Byzantine deployment was text book work; cavalry battle line with LH extending the formation and infantry held back in support. Psiloi were brigaded together intending to seize the field splitting the Sassanid line. Infantry support foiled an attempt by nomad light horse to take the Byzantine camp which the main battle line performed a convincing use to text book drill to crush the Sassanid. Score 4 + 2Hd – 1 E. Byzantine. The Byzantine found themselves with their backs to an open plain facing a Sassanid right wing of foot and elephant and a left wing comprising all the Asavaran, cataphract and light horse. In less than one hour (4 turns) the Sassanid turned the Byzantine world on its head and proceeded to cut the cavalry to pieces. Score 4 – 1 Sassanid. Both sides had access to allied troops, but none were employed. What did seem unusual was the uncharacteristic performance of the levy. Once committed to combat, they tied down valuable troop types that would have been better employed elsewhere. The Byzantine paid dearly in game three and the Sassanid Asavaran took advantage of their extra number to produce a solid victory. For all their light horse and infantry lacking armour, the later Moorish proved a tenacious opponent. As the attacker, the Byzantine were able to deny the Africans any advantage of terrain and caught their army on the open plain. All the Byzantine infantry formed on the left taking advantage of the wooded hill and the cavalry deployed in line covering the distance between two hills. A small column was set with the task to encircle the Moorish open left flank. The Moors launched their own surprise by moving quickly to seize the tip of the wooded hill severing the link between the psiloi and the legion. On the extreme right a small Moorish column brought havoc to the rear of the Byzantine force. The situation settled down as the Moorish threats were taken out one by one. The flanking column ensured victory and brought a close to the battle. Score 4 – 1, E. Byzantine. The second game offered the Moors a better opportunity to deploy. Set well forward, the infantry took cover among the wood and hills allowing the cavalry to deploy further back. The narrow opening between the two features would hopefully negate the Byzantine advantage of numbers. Prepared for a flanking attack, the Moorish cavalry countered this and stalled the Byzantine effort to seize the hill. In the ensuing cavalry clash, the Byzantine Strategos heavily wounded was escorted off the field. 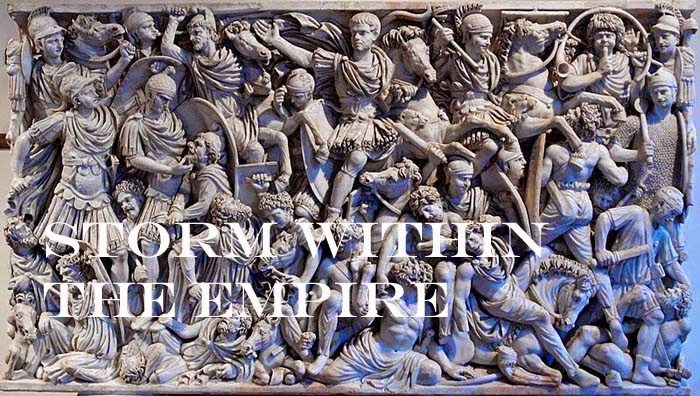 This brought both sides to one point from victory, but the East Romans were without a leader. Incensed by the loss of their commander and with a health pip score of ‘six’ the Byzantine were able to secure a victory. Score 4 – 3g, E. Byzantine. The final game saw all the terrain features placed in two quadrants leaving both cavalry forces an open field to manoeuvre in. The Byzantine first line moved well ahead to lure the Moorish light horse to attack. The Moors responded by bringing their infantry down from the hill to pin the infantry support and a lone Moorish light horse hovered on the opposite flank. The ploy worked and the Byzantine cavalry fell back to a new position while extending their line. The Moors in turn were forced to follow their charge through. The battle lasted another 30 minutes (2 turns) with the Byzantine cavalry winning the day. Score 4 – 3, E. Byzantine. Historical Match up - Early Byzantine vs. the Nobades. This was the second in a series of nine matches. The Nobades are predominately an infantry army with equal numbers of spear and archers supported by cavalry and home terrain being ‘Dry’ afford them an ample selection of rough and bad going terrain. The Nobades deployed first and positioned their infantry spear flanked by archers as their first line. These would be supported by all the mounted which formed the reserve. The Byzantine faced the Nobades infantry with all its legionnaires and psiloi. With the exception of the Herul all the Byzantine cavalry formed on the left with their main objective would be to envelop the Nobades reserve and by sheer weight of numbers would destroy their mounted arm. Paralysed by the impending danger, the Nobades cavalry caught flat footed (low pip score). The Nobades tribesmen surged forward to meet the Byzantine infantry. The Byzantine cavalry changed from column to line formation leaving the Hunnic LH to complete their encircling move. The battle was brief and hotly contested as both sides reach 4 – 4 score on the same bound. A final effort by the Byzantine cavalry secured the victory by eliminating the Nobades general. Score 6g – 4, E. Byzantine. The second engagement was quite similar in deployment as the previous battle. The Byzantine mobile column performed their task efficiently to secure the victory, again by taking out their general. The Byzantine infantry added their success to complete the victory. Score 5g – 0, E. Byzantine. The final battle, the Nobades deployment reflected a change in strategy. Taking advantage of a difficult hill to secure their right, the army deployed in echelon with their left refused. The troops so positioned would foil any attempt by the Byzantine to turn an open flank. Emboldened by their previous victories, the Byzantine modified their plan by placing nearly all their cavalry and infantry on the right and leaving the Herul and Huns to cover the centre and left flank. The Nobades were not slow to react as they quickly moved troops to add weight to the endangered left flank. The Byzantine cavalry struck first shattering infantry formations and their cavalry recoiling under the weight of numbers. The Byzantine infantry joined the battle committing all but the Huns who were lurking about for their moment. In two bounds, the battle was over. Score 5g – 1, E. Byzantine. Historical Match-ups - Early Byzantine vs. Nomad Arab. I have decided to set aside the 'Migration to Kingdom' project for the moment and do a series of historical match ups using the newly completed early Byzantine army. I expect these will require a learning curve as they are predominately cavalry with a small support group of infantry. Their opponents will include all those listed for III/4a with the exception of the Southern Slavs, so this will generate nine matches totalling 27 games. Early Byzantine vs. Nomad Arab Army. Nomad Arab deployed in the depression between two difficult hills. The Byzantine lines were broken by the rough ground and sand dunes that spotted their deployment area. Throwing caution to the wind, the Byzantine cavalry struck first followed by the supporting left wing and the infantry. This had the desired effect breaking the nomad line into smaller groups that were easily picked off by supporting troops. Score 5 – 1 E. Byzantine. Both sides made adjustments to their tactical plans. The nomad would adjust the number of terrain items so as to work to their advantage and the Byzantine would use their speed of manoeuvre to encircle the nomad horde. The Byzantine made use of the rough ground and difficult hill to position their infantry while all the cavalry formed up on the left flank. The nomad concentrated their infantry in centre and positioned their mounted troops evenly on both flanks. The attempt to hold back the Byzantine encircling manoeuvre failed as the main column slipped between the two active melees. Forming line, the Byzantine cavalry swept the nomad reserve taking out their chieftain. Bereft of their command, the nomad infantry were cut down bringing an end to a hard won battle. Score 4g – 3 E. Byzantine. Neither side were hampered by the rough terrain and deployed in their standard formation; a Byzantine cavalry line supported by infantry facing an Arab infantry centre flanked by two wings of mounted troops. The battle turned into a brutal slugging match with each side matching the other’s score. The lines became thinner exposing a flank or two and seized as an advantage by the opponent. In four or five turns, the battle was over; Score 4 – 3 Nomad Arab. Changing the terrain items did help the Arab in games two and three as this placed the sand dunes as a dominant feature on the battlefield. The Byzantine cavalry reigned supreme when they could manoeuvre and utilise their advantage of speed; however, forced into a slugging match they did not always do well.